Featuring an innovative easily-removed sheath that maintains a slim profile, the 17.5" Freescape Hatchet serves well in its capacity as a rough, ready, and clever tool in the Gerber Freescape series. Tackle Any Campsite Duty - With a forged steel head that's world class in strength, and a design that ensures efficient and reliable chopping, the 17. 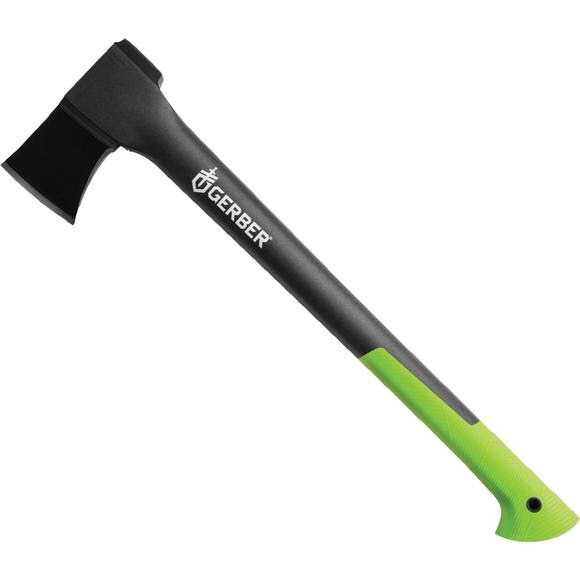 Tackle Any Campsite Duty - With a forged steel head that&apos;s world class in strength, and a design that ensures efficient and reliable chopping, the 17.5" Freescape Hatchet can tackle a myriad of campsite duties. Create kindling for the fire, pound in tent stakes, or make a primitive shelter with ease. Coated with a low-friction surface, the hardened blade slices through wood at a greater than average depth, allowing for faster chopping and maximum overall performance efficiency. Bright Accents For Quick Visual ID - Keep the 17.5" Freescape Hatchet&apos;s solid composite handle with soft touch over-mold firmly and comfortably in the hand no matter the conditions. With bright green accents juxtaposed against the black glass-filled nylon of the handle, it draws just the right amount of attention to itself so as not to get left behind.